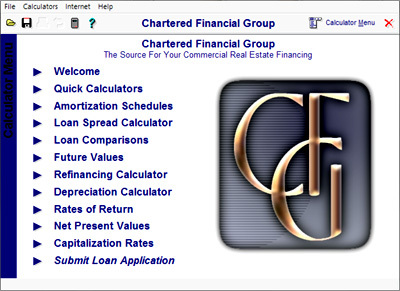 The Chartered Financial Group Commercial Real Estate Calculator is a comprehensive Windows software suite for commercial real estate professionals. This suite includes ten different analysis tools and an integrated financing program. Be sure to install this software suite on your office, home and laptop computers! "Click here to download" the CFG Commercial Real Estate Calculator. When prompted, chose "Save" and save to your hard drive. To install double-click on CFGCommercialRECalculator.exe file, then follow the on-screen instructions. 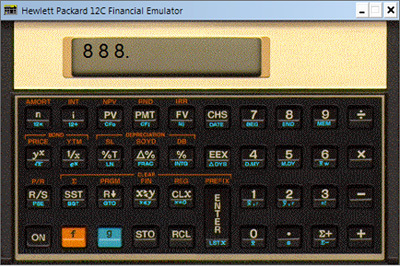 The HP-12C calculator emulator is a software version of that classic calculator for your Windows desk top and laptop computers. This programmable financial calculator utilizes reverse polish notation with a 4 register stack, 99 program lines available for programs, financial registers, 20 data storage registers, and continuous memory. Functions include percentage, statistics, linear estimation, calendar, financial, depreciation, bond price and yield, discounted cash flow analysis. Calculator programs feature conditional branching and looping. Also, the calculator has the ability to store multiple programs. The HP 12C is the standard handheld calculator for commercial real estate professionals. "Click here to download" the HP 12C emulation software. When prompted, choose "Save" and save to your hard drive. To install, unzip the file and double-click, "Setup.Exe" then follow the on-screen instructions. We thoroughly enjoy the business that we do in Hawaii and have put together a screensaver with 60 great photos of some of our favorite places. This screensaver also includes piano background music. This is available to our clients and friends in the industry as a free download. "Click here to download" the CFG Commercial Real Estate Calculator. When prompted, chose "Save" and save to your hard drive. To install, unzip the file and double-click, then follow the on-screen instructions.